Some of you will have met Farmer Nick already as he has been visitng schools and taking school trips on the farm for over five years now. The Alvis family have been making the finest Farmhouse Cheeses since 1952 at Lye Cross Farm, which is situated at the foot of the Mendip Hills only a few miles from the village of Cheddar in Somerset. 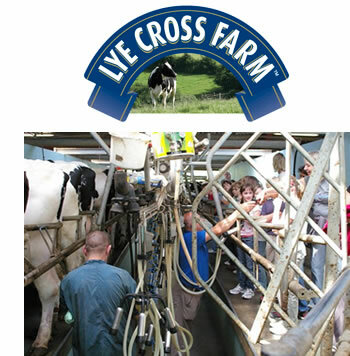 Milking over 1,000 cows at the three Alvis family farms, the rich, flavoursome milk is used to produce a range of Traditional and Organic Cheddars that are sold as Lye Cross Farm Cheese. Whether farming organically or conventionally, there is a total and ongoing commitment to the care of the environment, the animals and employees. Only contented animals can realise their full potential. To achieve this, maximum use is made of naturally grazed grass for the cattle throughout the growing season and as much other home produced feed as possible. We take pride in the animals and the countryside in which we work, so use only the inputs that are really necessary and take the view that whatever is done needs to be sustainable and has a positive impact for future generations. John Alvis – Managing Director of Alvis Bros and the founder of FarmLink says “At last the vision of every child having the opportunity to have a real understanding of the countryside, its importance and work is more than just a dream”. FarmLink is building on the Alvis aspiration of every consumer understanding where their food comes from and the impact their purchasing decision has on the environment, the animals and the people looking after the animals and land. Three generations of the Alvis family have been making the highest quality cheddar cheese on their farm at the foot of the Mendip Hills.